Earlier this week, we posted our review of Intel’s newest processor, sixth-generation Core series, aka Skylake. While we were able to provide comparison points with more recent processors like the fourth-generation Haswell/Devil’s Canyon and the fifth-generation Broadwell, that’s as far back as we went. Truth is, we’ve cleared our labs of most hardware older than Haswell now—no surprise there, considering Haswell launched over two years ago. But, we also have PCs at our homes that sometimes aren’t quite so up to date, and one of those is a dusty but still fully functional Nehalem (Bloomfield) system that’s nearly seven years old. Yes, we’re talking about a true first-generation Core i7 processor. Nehalem is considered first generation, but that’s lumping a bunch of chips into one big bag. The Nehalem family launched at 45nm with Bloomfield for consumers, and shortly thereafter as Nehalem EP for workstations and single socket servers; all of these used the LGA1366 socket. (There was also Nehalem EX for dual- and quad-socket servers, using a different socket.) Then there was a 32nm die shrink version codenamed Westmere EP/EX that also targeted servers and workstations, which later came out as a consumer chip with the codename of Gulftown, a 6-core/12-thread processor that also ran in LGA1366. Sandy Bridge was 32nm as well and moved to socket LGA1155, Ivy Bridge shrank to 22nm and also used LGA1155, Haswell was 22nm on LGA1150, and most recently Broadwell was 14nm on LGA1150. Depending on how you count, that’s seven generations counting Skylake. But since we’re talking about missing generations of Core processors, we should also mention Lynnfield, the “mainstream” offshoot of Nehalem that launched a year after Bloomfield, on socket LGA1156. That marked the split between Intel’s mainstream and enthusiasts platforms, and they’ve been going their separate ways ever since. And who can forget the original Core Duo (Yonah) and Core 2 Duo (Merom and later Penryn), which is when Intel finally killed the Pentium 4 NetBurst architecture and kicked off their tick-tock strategy? By our count, somehow Intel conveniently left out several generations of Core processors—sort of the opposite of Microsoft and Windows 10, aka “No Number Nine Necessary”. But moving on, we were talking about our old Bloomfield PC. At its launch, Bloomfield was the new high-end platform from Intel, with triple-channel DDR3 memory support. It was paired up with the X58 chipset (Northbridge), which provided 36 PCIe 1.1 lanes. 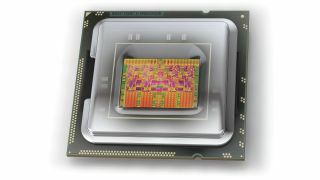 Bloomfield/Nehalem also represented Intel’s first ever integrated memory controller, which helped to reduce memory latency by moving the memory interface onto the same die as the CPU. There were limitations, of course: USB 2.0 support came via the ICH10 Southbridge, along with the SATA connections—which were limited to just 3Gb/s. USB 3.0 ports or SATA 6Gb/s ports required additional chipsets on the motherboard, or you could use a PCIe adapter card. In other words, by going back nearly seven years, we’re seriously limiting the features offered by our test rig! But it’s a testament to the quality of the old Bloomfield/X58 platform that we’re still running it, and it actually continues to work quite well, all things considered. It’s so old that we actually had to replace the motherboard’s CMOS battery in order to avoid losing date/time and BIOS settings in the event of a power failure, but otherwise it’s happily chugging along. In fact, Nehalem has done so well that even now, we still get people wondering if it’s even worth the hassle to upgrade to a “more modern” platform. That brings us to the purpose of today’s article. Some readers asked for it, and we’re happy to accommodate them: Just how much faster is Skylake compared to a first-generation Bloomfield system? Many people purchased i7-920 processors and overclocked them to 3.6GHz (give or take), which basically matches the clocks on our i7-965. While we’re here, we can also muse about where the industry is headed and what patterns are emerging, and hopefully relive a few good times during our stroll down memory lane. Here’s the full list of specs for our Bloomfield and Skylake platforms. Bloomfield: a bit dusty but still running fine! Okay, full disclosure: This test system is my own old PC, and it’s near and dear to my heart as I used it for work, gaming, and just about anything else I needed to do on a PC from 2009 up until about a year ago when I finally upgraded to Haswell. Now the PC is used by my wife (and children), not because I don’t have anything faster for them, but because it has all her files and preferences, it’s running properly, and she hasn’t requested a change. If you’re wondering, the GeForce GTX Titan X was installed purely for testing purposes; normally the PC has to “make do” with a GTX 770. Over its life, the system has gone from an HD 4870X2 to dual HD 5870 to dual HD 7970 cards, before I retired it from gaming use and put in the single GTX 770. Not a bad lifespan for a PC, and something I never would have done ten or twenty years ago when it seemed every two years brought enough of a performance boost to warrant an upgrade. Those were heady times…. Those expecting first-generation Core to tuck its tail between its legs and go run and hide should find these results a bit sobering. Sure, Bloomfield isn't the fastest processor, but for less demanding use cases there’s hardly any need to try to keep up with the Joneses. Skylake is clearly faster than the old i7-965, but particularly when you look at the i5-6600K stock results, it’s really not that much faster. The i5-6600K is only 15 percent faster on average compared to Bloomfield at 3.67GHz, and even the i7-6700K is only 37 percent faster. If we toss in overclocking on Skylake, the gap widens to 39 percent for the i5-6600K at 4.6GHz and 61 percent for the i7-6700K at 4.7GHz, but there are plenty of cases where we aren’t anywhere close to double the performance. If you’re wondering why Bloomfield and X58 have managed to hang around for so long, look no further than the mainstream benchmarks like PCMark 8. Storage and graphics help Bloomfield stay relevant, and for these system wide benchmarks the difference between first- and sixth-generation Core is quite small. Bloomfield equipped with a modern GPU is actually able to beat Skylake (with overclocking) on the Home and Creative tests. No doubt the Titan X is helping here, as the Skylake system was tested using its integrated HD Graphics 530 for the above benchmarks. (For the record, PCMark 8 results on stock i7-7600K with Titan X are 4895 Home, 7598 Creative, and 5161 Work. No surprise that the Creative suite benefits the most.) But that’s just it: Even an archaic PCIe 1.1 connection is apparently good enough for most single GPUs in 2015. That might sound shocking, but check out our gaming results. Note: Average is the geometric mean of the nine tests, using (3DMark / 100). Here we’re running the fastest single GPU on both platforms in order to make the processor (and chipset) the biggest bottleneck possible, and we’re even running at a moderate resolution to further emphasize CPU performance. And yet, of the nine graphics tests, only three show more than a 10 percent improvement—and that includes the overclocked Skylake results! GTAV and Hitman: Absolution show the biggest gains from moving to a modern architecture, with an 18-28 percent boost in average frame rates, roughly matching what we saw earlier in generational CPU performance improvements; Metro: Last Light also shows a moderate improvement of 7-19 percent. Outside of those three, the performance is close enough to call it a draw—the average over the remaining six tests gives Skylake a meager 2-3 percent improvement over Bloomfield. In fact, there are even a few cases where Bloomfield posted slightly higher numbers than the i5-6600K. Oops! As if that’s not damning enough, DirectX 12 is supposed to help further alleviate CPU bottlenecks for games, so that even a moderate processor can keep up with a faster graphics card. If that sounds unreasonable, consider for a moment that the CPU cores in both the PS4 and Xbox One are horribly under-powered compared to even Bloomfield. Just how under-powered are we talking? A quad-core A4-5000 AMD APU managed a result of 0.39 in the single-threaded Cinebench 11 test, and 1.5 in the multi-threaded test. Even with perfect scaling from clock speeds and cores (the Xbox One is eight cores clocked at 1.75GHz while the PS4 is eight cores clocked at 1.6GHz), those CPUs would only muster about a 3.5 score in the multi-threaded Cinebench 11.5 test—about half the CPU performance of Bloomfield. And yet these gaming consoles are still able to power some nice visuals, thanks to the low level access developers have to the hardware. DX12 provides all of that for Windows users, which means once we start seeing DX12 titles, Bloomfield may be even closer to Skylake in gaming performance—at least on DX12 enabled titles. This isn’t to say that we should forget about the past seven years of technological progress and stick with LGA1366, however. For one, efficiency is not a strong point of the old architecture. At idle, Skylake on our desktop is using just 39W at the wall (50W when overclocked); the Bloomfield system by comparison draws 131W idle. Under load, the story is similar: running Cinebench, Skylake is pulling 104W at stock on the i7 and 155W when overclocked; Bloomfield at 3.67GHz and a bit more than half the performance requires 249W—or put another way, i7-6700K delivers nearly four times the performance per watt. Part of that comes from LGA1366 being an “enthusiast platform” though—our Haswell-E test bed as another example idles at 110W, and running Cinebench (with a 4.2GHz overclock) pushes it to 234W; of course, Haswell-E does deliver more than twice the performance of i7-965 in this sort of workload. Of course no one is looking to buy a new Bloomfield PC today, but if you’re already running such a system and you’re not doing video editing or other CPU intensive work, the upgrade bug probably still isn’t biting. Haswell was a good upgrade to Bloomfield back in the day, and for enthusiasts we’ve now had Sandy Bridge-E, Ivy Bridge-E, and Haswell-E. If none of those were sufficient reason to upgrade during the past five years, however, Skylake doesn’t really change things relative to Haswell. There are new features that are worth having, but for mainstream users there are no “must have” items. Let’s be clear: we love the speed of Haswell-E when it comes to video editing and other complex tasks; it’s substantially faster than mainstream systems. There’s no way we’d want to go back to Bloomfield for that sort of work. But when I asked my wife if she had any complaints with my old Bloomfield system, the answer, not surprisingly, was no. Sure, the fact that the system has an SSD helps, which is the first thing to upgrade on any system using conventional storage. With 500GB SSDs now priced well under $200, there’s really no need to suffer with putting your OS on a hard drive. But until the motherboard or some other critical component actually goes belly up, she and many others like her will keep on plugging along with “outdated” hardware. On the one hand, this is sort of sad. We remember fondly the earlier days of the PC when performance was doubling every two years (sometimes less). The old 80386 launched at 12MHz, and within two years it was running at a lofty 33MHz. 80486 was just as good, starting at 20 and 25MHz in 1989 and finishing at 100MHz by 1994. The very first Pentiums were 60 and 66 MHz parts in 1993, with 233MHz models by 1997. (Those were also 15-17W parts, if you’re wondering.) Even in the days of Pentium 4, we went from 1.4/1.5GHz parts in 2000 to 3.4GHz by 2004—still more than double the performance within a four year span. But that was the end of an era; starting with Core 2, clock speeds gave way to adding cores. Core 2 launched with 2.67GHz parts in 2006 and the fastest parts ended at 3.33GHz for dual-core and 3.2GHz for quad-core two years later. And that brings us back to Bloomfield, which launched in 2008. Here we are, Q3 2015, and over a variety of applications we’re only seeing about a 30 percent improvement in overall performance. But just because pure clock speeds and performance aren’t shooting up doesn’t mean we’re not seeing some real improvements in other areas. At stock clocks, i7-6700K is around 30 percent faster than a moderately overclocked i7-965. There’s something else that’s also faster than i7-965: just about every quad-core i7 notebook CPU since Haswell. Yeah, let that sink in for a moment. The Acer V17 Nitro Blackwe recently tested manages around 20 percent better CPU performance than our old overclocked Bloomfield, and it idles at less than 15W with load power on CPU tasks measuring 75W (including the display). And for a lot of people, quad-core i7 notebooks are more powerful than they really need; a good Ultrabook is more portable, fast enough, and has great battery life. Quad-core Haswell notebooks are also faster than Bloomfield. No wonder Intel and others have been focusing more on power efficiency for the past several generations than on raw performance. Desktops aren’t going away any time soon, as there will be a certain market segment that always needs more performance, but they’re just one of a variety of computing devices in today’s technology saturated world. Laptops deliver all the computing power most people need on a day to day basis, and in turn plenty of people are increasingly using smartphones to do tasks that were traditionally handled by desktops. Ironically, the same people that would balk at spending $1,000 to upgrade their laptop or desktop to a modern system are often the first in line for a brand new $500 smartphone, complete with a two year contract. Where do we go from here? 14nm is just the tip of the iceberg; Intel still has plans for 10nm, 7nm, 5nm, and even 3nm. Even if we slow down to process updates every three or four years, we are fast approaching the true end of Moore’s “Law”. No one is quite sure where process technology will actually stop, but the size of a copper atom is 128pm and aluminum is 125pm, so that’s a pretty hard limit, and likely we won’t ever get that far due to quantum tunneling and other issues. That means the slowing down of computing demands may not actually be such a bad thing.